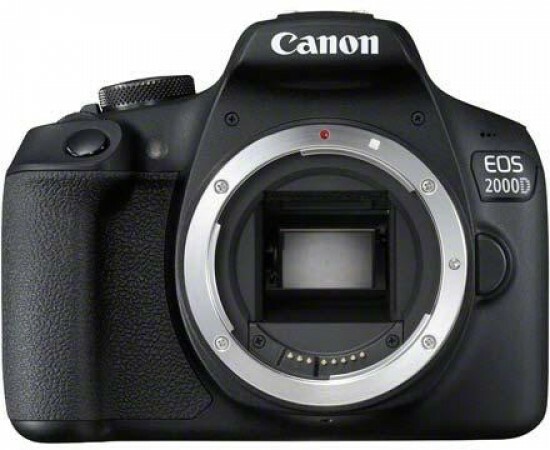 The Canon EOS 2000D (also known as the Digital Rebel T7 in North America) updates the EOS 1300D / Rebel T6 as Canon’s entry-level DSLR camera aimed squarely at first-time interchangeable lens camera buyers. This latest model is more evolution than revolution though, as it carries over almost all of its predecessor’s key features, with the exception of a new 24.1 megapixel sensor, up from 18 megapixels on the EOS 1300D. Otherwise the 2000D gets the same Digic 4+ processor as its predecessor, resulting in a modest 3fps continuous shooting rate and a maximum standard sensitivity of ISO 6400 (expandable to 12800). Full HD video at 30fps is again available, rather than 4K, as is a Video Snapshot mode that combines short video clips into a montage sequence. The EOS 2000D also sports a 920k-dot LCD screen plus built-in Wi-Fi with NFC pairing for wirelessly transferring images to a mobile device for sharing, as well as remotely controlling the camera from a smartphone or tablet. The Canon EOS 2000D is available body-only for £369.99 / €429.99, or comes bundled with the EF-S 18-55mm lens for £469.99 / €549.99 / $549.99. 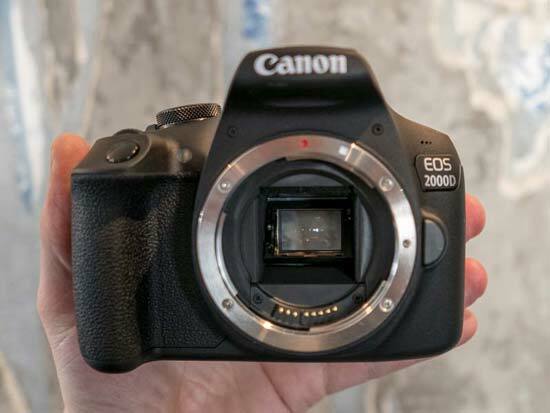 Externally the Canon EOS 2000D is virtually identical to the 1300D that it replaces, which we reviewed exactly two years ago. The control and button placement is as good as identical, and so too is the camera’s physical size and weight. At 129mm wide, 101.3mm high and 77.6mm deep, the 2000D has exactly the same dimensions, and also weighs almost the same at 475g ready to shoot, a whole 10g lighter than the 1300D. That makes it 30g heavier than a Nikon D3400, and the Nikon is also smaller than the 2000D in every dimension, measuring 124 x 98 x 75.5 mm. However, such marginal size and weight differences have little impact in real world shooting. Here the 2000D’s carbon fibre polycarbonate body feels reasonably solid and well built, though predictably for an entry level Canon DSLR, it isn’t weather sealed. The 2000D works well ergonomically, with a decent-sized rear thumb rest and the exposure compensation and playback zoom buttons positioned conveniently on either side of it. The main hand grip is nice enough, but the finger recess is a little shallow, which can make it difficult to grasp comfortably if you’ve got larger hands. Still, given the 2000D’s light weight, this isn’t a major bugbear. 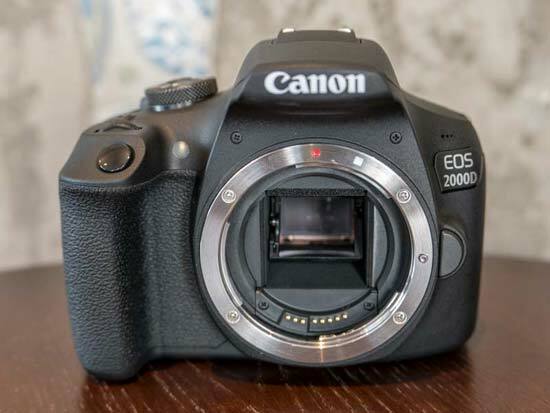 A primary selling point of the Canon EOS 2000D to first time DSLR buyers is its ease of use. Nothing has changed in this respect from the 1300D, but that’s no bad thing. 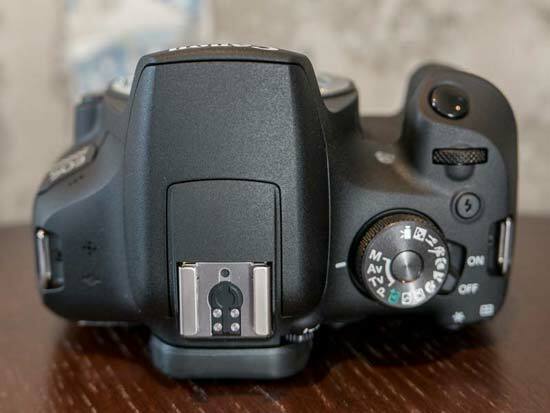 The 2000D still gets dedicated ISO and white balance buttons on the rear panel – physical controls you won’t find on a Nikon D3400 – while other key shooting settings like file quality and exposure modes can be accessed easily by pressing the Q button which activates the quick-access menu. This will also let you adjust the +/- 5EV of exposure compensation, but it’s quicker and easier to set this by pressing the dedicated exposure compensation button located immediately above the Q button whilst rotating the single, top-panel control wheel. Another aspect of the Canon EOS 2000D which isn’t immediately intuitive is the mode dial. It’s cluttered with various scene mode settings, including Night Portrait, Food, Sports, Macro, Landscape, and Portrait presets. There’s also a Creative Auto mode that operates exactly as regular Auto mode, except you control the extent of background blur you’d like behind your subject by adjusting a virtual slider. All this does is adjust the lens aperture, so once you’ve learnt about aperture, good old aperture priority mode renders Creative Auto pointless. Aside from the usual selection of auto, semi-automatic and manual modes, the 2000D’s mode dial also includes a video mode and a Flash Off mode, whereby the camera shoots automatically but won’t fire the flash; useful in museums or religious buildings. Returning to the rear panel and, along with the dedicated ISO and white balance buttons, the 2000D also offers a convenient drive mode button. This lets you choose between single shot, continuous, self-timer with a 10-second or 2-second delay, and also a continuous self-timer function where the camera will snap a burst of shots after an initial delay. Standard continuous shooting speed is unchanged from the 1300D and is still a rather sluggish 3fps, mainly due to the 2000D using essentially the same rather dated Digic 4+ image processor. Another area where the new Canon trails the Nikon D3400 is video, although the difference is slight. Both cameras will shoot Full HD 1920 x 1080 resolution, but where the D3400 can do so at 60fps, the 2000D can only manage 30fps. Shooting a video first requires you to rotate the main mode dial to the video position, where you can then press the Live View button located alongside the viewfinder to start and stop recording. The 2000D also includes a Video Snapshot feature, whereby the camera will record video clips lasting two, four or eight seconds and compile them into a Video Snapshot Album (a montage sequence) with the option to add your own background music. 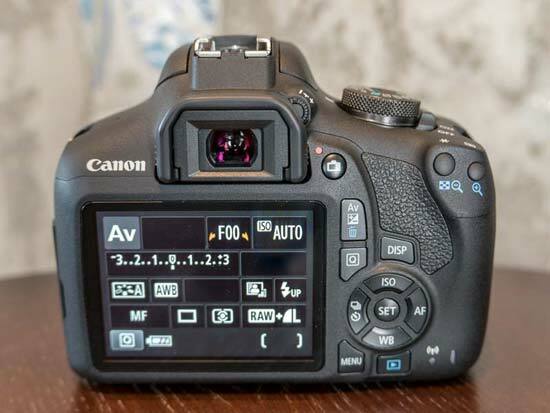 Most of the hardware inside the Canon EOS 2000D has been carried over from the 1300D, including the LCD monitor. The 3-inch size remains the same, as does the 170-degree horizontal and vertical viewing angles and a respectable 920,000 dot resolution. Sadly, the screen still doesn’t feature touch sensitivity. This makes sense in terms of cost cutting, but it isn’t such a smart move when you consider a significant portion of 2000D buyers are likely to be young first-time DSLR buyers used to touch-driven photography on their smartphones. The 2000D continues to offer built-in Wi-Fi with NFC pairing. The system uses Canon’s Camera Connect mobile app to enable wireless image transfer and remote camera control. Connecting your smart device is painless, and once linked, the 2000D can be controlled remotely with very little signal lag. The app also lets you control shooting functions like ISO sensitivity, exposure compensation and the drive mode. When it comes to sharing your shots, the Wi-Fi link transfers a full resolution image almost instantly, although image previews do take a couple of seconds per shot to preview properly when scrolling through your memory card’s images. Whichever lens you choose, the Canon EOS 2000D’s 9 AF points are well spread across the image frame, and though only the central point is the more accurate cross-type, autofocussing in our hands was quick and mostly accurate in all but the darkest conditions. Switch to live view and things get much slower though, with contrast-detect focussing requiring a second or so to establish maximum sharpness and correct focus. However, this needn’t be a major issue when using live view to compose and shoot shots like close-ups, where careful consideration and an eye for detail are more important than speed. Last but not least is battery life, which is unchanged from the 1300D at 500 shots from the LP-E10 rechargeable Li-ion power pack. As with so many of the 2000D specs, it lags way behind the D3400’s incredibly impressive 1200-shot CIPA rating. It’s also worth noting that the 2000D’s battery compartment on the bottom of the camera also contains the memory card slot, which is a little fiddly to access and can also be blocked completely by larger tripod mounting plates. The D3400's and more conventional side-accessed card slots is much more convenient.